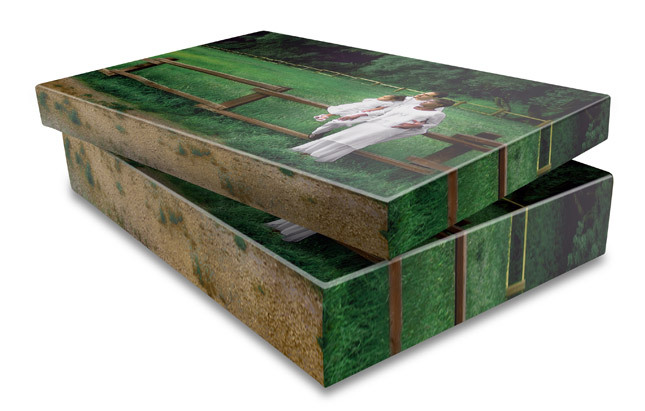 Our Gallery Wraps offer a striking way to present your images. We print your image on a special Durable Canvas material and wrap it completely around a 1.5″ or 2.5″ wooden stretcher bar. The outer edges of the stretcher bar are covered with the image. The inks used in the solvent printing process are waterproof. Gallery Wraps are delivered “ready-to-hang”. Backing material and a hanging device are added to the Gallery Wraps, including a saw tooth for 20×24 and smaller or a wire hanger for 20×30 and up. Standard sizes range from 8×10 to 34×54 with custom sizes available. Sometimes change is a good thing, and Genesis’s Gallery Wraps! You’ll immediately notice the richer color saturation, deeper blacks, and wider color gamut our new canvas provides, but what else can you expect? Heavyweight and ultra durable 400 gsm white poly-cotton blend matte canvas with archival certification. The new canvas in combination with our inks give a water resistant finish. We’re happy to announce that the new canvas is 100% free of optical-brightener additives and has been tested and approved by the International Fine Art Trade Guild for print permanence. It also meets the Archival Standards set forth by the Fine Art Trade Guild for pH and lightfastness. You’ll find that with a heavier 2-on-1 weave, our new canvas is more flexible than before. We are proud to announce this is also a Green Product! For every roll of canvas our lab uses, they purchase and plant a tree for the environment!